The ability to simulate events that can effect operations within the Nuclear Industry is an invaluable tool. At Pyragon we understand that knowing the possible scenarios and being prepared for what may occur is key. We offer five valuable testing capabilities that will improve Nuclear Plant planning and Operations. The following testing capabilities are now available Electrical Transients, Electro Static Discharge, Thermal Aging, MTBF Analysis and RFI and EMI. Electrical Transients test the operation of equipment in situations that mimic large voltage surges and spikes caused by electrical storms or major power switching events that can occur within large scale plants, such as a power generation facility. Pyragon offers transient testing to IEC Standards of 61000-4-4 Electrical Fast Transients, 61000-4-5 Surge and 61000-4-12 Ring Wave. Electro Static Discharge is a test designed to test equipment that may be subjected to static discharges brought about by events such as human touching or other process related routines. Pyragon Inc. can test to IEC Standard of 61000-4-2. Thermal Aging testing is the ability to subject a piece of equipment to a 15 to 30 day test based upon variable temperature and humidity conditions. This is then coupled with complex mathematical modeling and is meant to show a devices performance over 15 to 30 years. 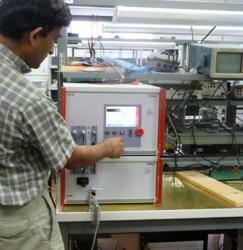 Mean Time Between Failure Analysis or MTBF can be done on equipment that Pyragon manufactures. This typically gives a better, more accurate result than software MTBF calculations where the software does not have any knowledge of the design of the circuit being analyzed and does not take into account the criticality of a given component. RFI and EMI tests consist of Radiated and Conducted Susceptibility tests that are designed to determine equipment performance when exposed to radio transmission waves produced by items such as walkie talkies. Pyragon offers IEC Standards of 61000-4-3 Radiated Susceptibility and 61000-4-6 Conducted Susceptibility.